Can you really get high-speed broadband on the go? Mobile broadband has really taken off in the past few years, with all the major providers getting in on the act. Having a broadband connection wherever you are is a great idea; it saves you the pain of finding a wireless hotspot, and basically enables you to work anywhere. That's the theory at least. In many cases, speeds are slow and coverage patchy. However, faster and faster mobile broadband offerings are appearing all the time, and the latest such offering is from Virgin Mobile. They've added a 7.2Mbps mobile broadband modem option to their tariff; the dongle is £25 on a £10-a-month contract with 1GB of data, or free on a 18-month fixed contract for the same data. There's a range of other payment options available too, but there's no 'unlimited' data plan. Using the Virgin broadband dongle was a bit hit and miss; it always worked and didn't crash, but did display some odd behaviour. After inserting the dongle we occasionally got a message that System Preferences needed changing, but they did not. We'd often get a warning on unplugging too. That said, when the connection was up and running it was steady and reliable. However, the speed was nowhere near as fast as advertised. At most we got 1.5Mbps, but the connection spent much of the time around the 0.5Mbps region. We tested in multiple locations and with different computers, and even tried a Windows PC to see if it was a Mac software issue. It wasn't. 0.5Mbps is enough to get email and basic web surfing very comfortably, but audio streaming or iPlayer? Forget it. 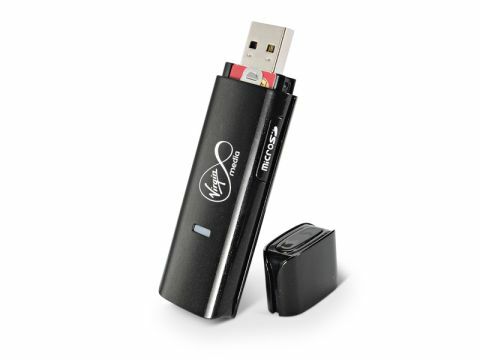 As it stands, the Virgin Mobile broadband dongle is difficult to recommend if you're looking for the speeds it claims to offer.